From secondary breaking in mining or quarrying applications to pavement and concrete applications or breaking in demolition, BTI's CX small size hydraulic rock breaker attachments for skid steers and small excavators get your job done easily and efficiently. Our high-strength allow plate steels construction means you're getting the highest quality hydraulic rock breaker for continuous duty in harsh environments. EASY TO SERVICE: With fewer parts integrated into the design, servicing the hydraulic breaker is both easy and less expensive. LOW OPERATING COSTS: High flow rates and low operating pressures minimize heat generation and hydraulic shock loading for smooth operation and maximum service life for both the carrier and breaker. REDUCE NOISE LEVELS Boxed housing keeps the noise levels down, essential in high-density population areas. 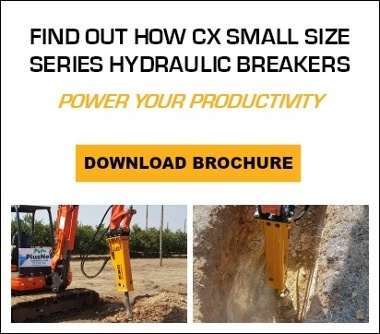 OPTIMIZE PRODUCTION: Hydraulic breaker-mounted manual high/low stroke selector (CX8) valve optimizes power and speed, giving you options for different applications.